I always find the name of this store kind of ironic, Design Within Reach. Personally I think most of their stuff is way out of my reach. I'm sure I'm not the first person to say that. Anyhow there were plenty of knock off options for these chairs (like the ones below), but they weren't getting great user reviews, so I didn't want to risk it. 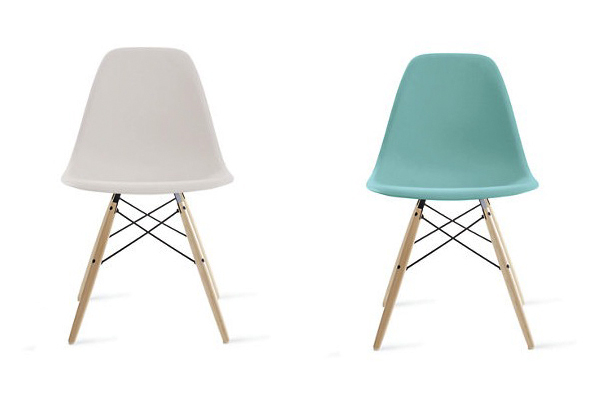 Plus, I didn't like the idea of saying I had fake Eames Chairs. These chairs are from Overstock. Instead I focused on chairs that had a similar aesthetic, but weren't nearly as expensive. I narrowed it down to what I really loved about the chairs, which was the molded plastic and unique legs. I really like the contrast of the plastic, metal and wood. Naturally, Ikea was the first place I checked. I found six pretty good options, and they were much more affordable. The Tobias and Erland were nice in person. The Tobias chair was also, really, really heavy, so I took that to mean it was quality. That said, I don't think $79.99 is that cheap for a chair that I didn't love. The Erland is nice too, but I wasn't crazy about the legs. I liked the legs better on the Tobias. 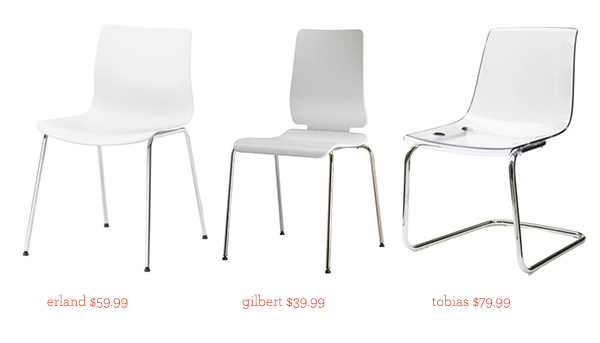 My least favorite is the Gilbert, but the price is right, and it was pretty comfortable. Of course, all of these are missing the awesome wooden legs. The Bernhard, Martin and Vilmar are more of the bent plywood look, but the aesthetic is pretty similar. I actually really loved the Bernhard chair, but I thought $150 was a little too much for it. I'm actually still checking craigslist occasionally to see if I can find these chairs for a little cheaper. The martin chair is VERY well priced, but I just didn't like it in person. It kind of felt cheap. The Vilmar chair had the wooden element, but I just wasn't crazy about the shape. 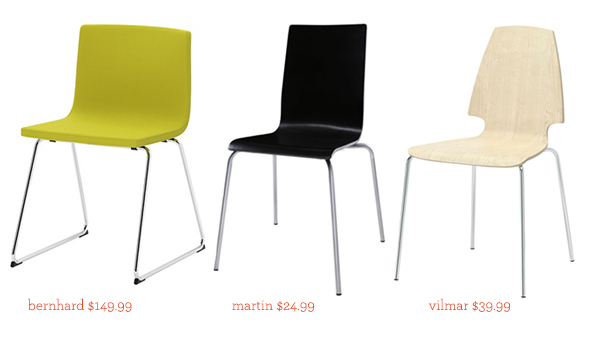 CB2 also has a lot of beautiful dining chairs, but they're not nearly as cheap as Ikea. 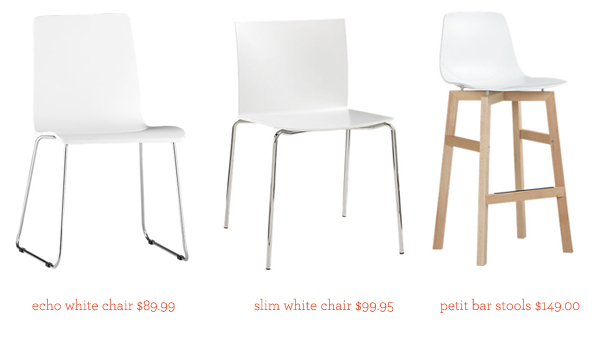 I really liked all three of these chairs, but I preferred the legs on the Echo White Chair. The Petit Bar Stool has those wooden legs, but they're stools so those wouldn't work for the dining table, plus they're pretty pricey. I didn't expect to find anything affordable here but I went to the local CB2 store to check them out anyway. When I got there I discovered that they were having a floor sale! 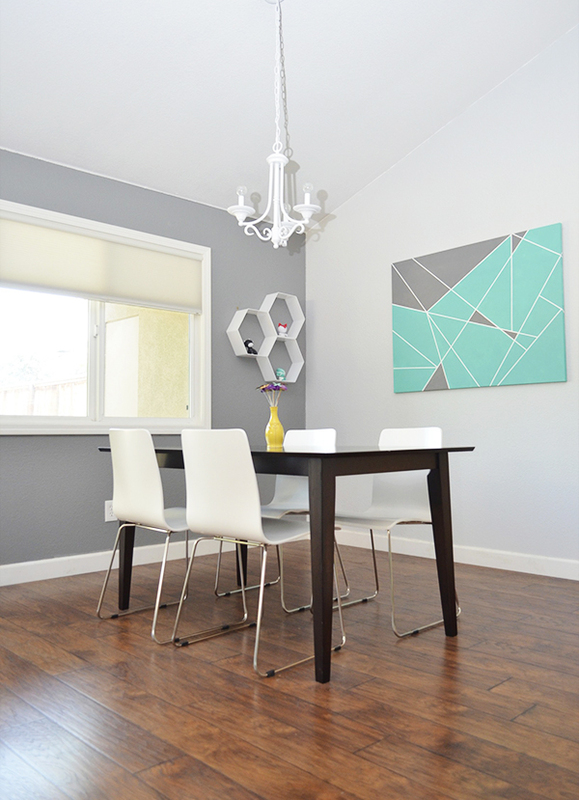 AND.....the echo white chair was one of the chairs on sale! They had three chairs, I needed at least four, preferably six, but I needed to make some compromises. Two of the chairs were on sale for $40 and the the other was on sale for $60. The two $40 dollar chairs had barely noticeable scratches on the back, the $60 dollar chair had even less noticeable scratches. So, I decided that I would buy one chair at full price, $90 and the other three on sale. So the grand total for 4 chairs was $230 (40 + 40 + 60 + 90), which made each chair $57.50!